Lots of things can go wrong, but one of the most common is people having problems with Outfitter not working at all. Crazy stuff like tons of errors (if errors are enabled), or it won't change outfits, or the UI is a train wreck. This happens pretty much for one reason: Outfitter was updated while WoW was still running. Just restart WoW all the way from the desktop (not just from login) and it'll be happy again. Why? Addons have a file called the Table of Contents which describes how WoW should load and start the addon. The problem is that WoW copies the ToC file into memory at startup and will never update it again as long as WoW is still running. If an addon update has changes to the ToC then WoW won't see those changes if it's still running while you update. Those changes to the ToC may include critical things like new files to be loaded. Without those files the addon likely can't even initialize itself correctly resulting in all those errors, mangled UI, etc. Feel free to report bugs in the comments section at the bottom of this page, but please don't paste in your bug/crash logs. Those logs are very large since they usually include the list of every addon you're running and that makes the post take a huge amount of screen space in the comments section. That, in turn, makes it very difficult for me to find previous questions and bug reports. Crash dumps are great and extremely useful, but please post them into a CurseForge ticket and then refer to that ticket in your comment so I know where to find it. Thanks! Outfitter is an equipment management addon which gives you fast access to multiple outfits to optimize your abilities in PvE and PvP, automated equip and unequip for convenience doing a variety of activities, or to enhance role-playing. Outfitter includes an icon bar for fast access to your outfits, a minimap menu for fast compact access, support for LibDataBroker, scripting with a library of pre-made scripts for most common tasks, item comparisons across outfits, and more. Outfitter can also generate outfits for you, optimized for a specific combination of stats you specify or using Pawn weights (must have Pawn installed). The cooking script is not working and gives an error when I enable a summon pet. @Mundocani is there something the user community can do to help get things fixed? Does any one know how to make outfitter windows- windows to set some options on gear set bigger? If it's the floating outfit bar that you want to resize, right-click on those handles that appear at either end when your mouse is over the bar and you'll find controls for customizing the bar. 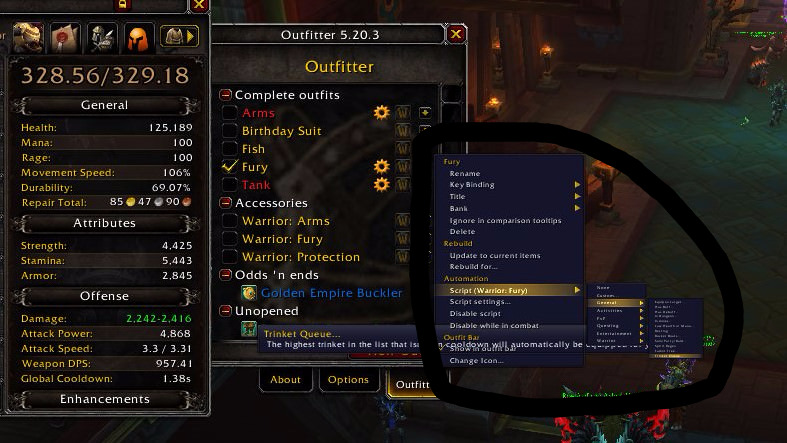 If it's the main UI you want to resize, then you can adjust the UI scaling in the game's settings, though it will affect all of your WoW UI and not just Outfitter. There's no setting for making just Outfitter bigger as it uses the same component scaling as the game. Its options windows that go after main window like in 3rd scrennshot that i would like bigger-size of 1st is kinda ok,but next in size is maybe 60% of that and next one i barley readable and if i want to use that windows i have to guess options. Is it possable to make those windows same size as main ui window? And on screen on monitor it seems smaller then on this picture beacuse of resizeing. When swapping outfits with the same Azerite pieces but different traits, outfitter does not swap these items, even if they are stored with the Blizzard Equipment Manager, which does properly swap these items. Thanks, I'll look at adding the Azerite traits to the item comparison. Could this be prioritized please? It's a very common situation, and it's extremely irritating to have to double-check my gear every time I change specs because Outfitter keeps equipping the wrong Azerite item. That would a good script, but I'm not sure what to trigger it on. Maybe equip on the first dig? Using the current version (5.20.3) with the current version of the BfA prepatch. I can't change outfits from the minimap button menu but they seem to change when I select them from the main Outfitter window. Correction: I can only change outfits from the main window a couple of times before it becomes inoperative. I think I can log out and back in to reset it, but it still only works a couple of times before it's FUBAR. (*temporary) = "attempt to call global 'GetMapNameByID' (a nil value)"
If you've already updated to the latest version, then you probably just need to re-select the Swimming script for the outfit using it. The script can become snapshotted if you accidentally edit it while viewing it (typing a space for example). Re-selecting the script will connect back to the built-in version so you'll get updates to it again. An actual bug report would be nice too snarky jackass. I downloaded the latest version 5.20.1 but I still cannot change my outfits or updates them. There are no error messages that pop up either. to enable error reporting, then do a /reload to see what's going wrong.